It was probably the first home I ever fetishized. I remember myself belly-sprawled on the floor, chewing my lip and flipping through the Sears Wish-Book, admiring the windows that really opened and closed. 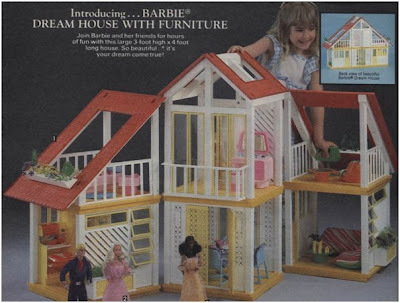 It represented all of my young ideas about worldy success - stylish furniture (in matching sets for every room); a modern kitchen tricked out with appliances; everything new and clean and specific in a hygenic new house made just for you. 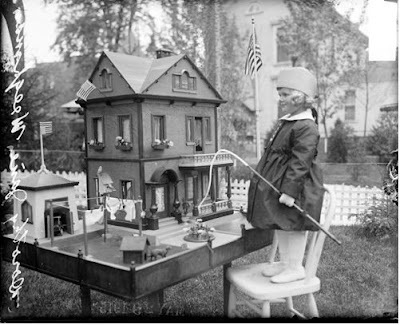 This photo of an enraptured little girl is from 1915, and even earlier examples abound, but back then, miniature dreamhomes were mainly the province of the well-to-do. 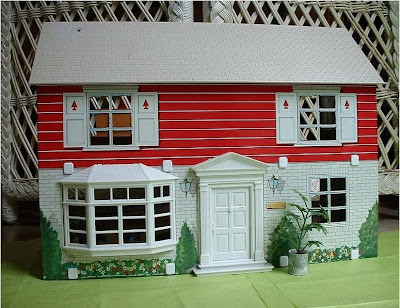 It wasn't until after WW II that dollhouses became affordable and mass-produced, neatly coinciding with the post-war boom in home ownership and general prosperity. These dream houses for all were disarmingly modest - brightly painted tin transmitters of the property aspirations of the newly solidifying middle-class. Picture windows, tile bathrooms, fireplaces, bedroom sets, well-kept yards for cook-outs and shiny televisions in pride of place. Modern and up-to-date, but not outlandish - no hot tubs or elevators. These appeal to me. I often think about creating my own little subdivision, a la Rachel Whiteread, but there's the rub: these little ranches and colonials were the cheerful harbingers of fifty years of relentless suburban growth.